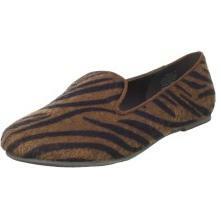 Give your wardrobe a taste of the wild with the Carlton slip-on from Wanted. Crafted with vegan pony fur, the loafer-style flat features a Tiger print upper with notches at either side of the tongue that enhance the fit and feel. The barely-there rubber sole lends flexibility and makes this a great everyday shoe for your casual ensembles. Available also in Leopard. In a fashion-conscious world that constantly pursues cutting-edge trends, Wanted Shoes remains dedicated to delivering the latest and greatest styles in women’s footwear. By keeping its finger on the pulse of fashion, Wanted distinguishes itself as a leading brand, with both quality and affordability. With a great team stylists who truly have a passion for fashion, Wanted Shoes remains true to its name, leaving women of all ages wanting more.